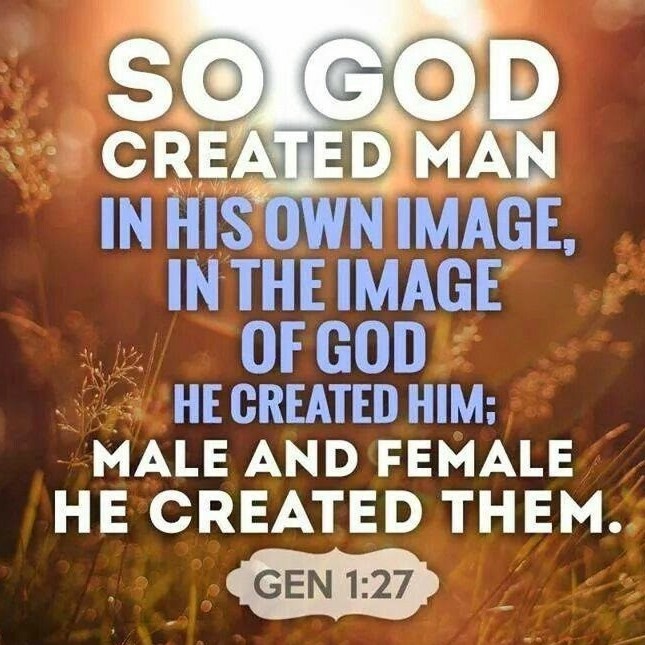 This past week I have been meditating on Genesis 1:26-27, which states that man was created in the Image of God. Wow! What an awesome truth to consider. What does being created in the Image of God mean? It speaks to the uniqueness of each person. Being created in God’s Image indicates there is that which is in us that is similar to and representative of God and that is reflective of characteristics of God. There is something of the divine stamped upon our souls. The Image of God is not just something we possess, but is what we are. That we are created in God’s image is crucial in our understanding as to what makes us unique as humans. While we are created in His image, the Bible does not define exactly what that means. However, there are several unique characteristics that distinguish man from animals that help us understand scripturally what it means to be created in His image. The Creator of this vast Universe in His holy-love created man with certain qualities that are intrinsic to His own nature. (1) We are more than a physical being, but also a spiritual being. Man is not an evolutionary accident, but God breathed into man the breath of life (Genesis 2:7). The spiritual part of us gives us the capacity to fellowship with the Creator (who is spirit- John 4:24) and it is that part of us that will live beyond the grave. One who does not understand this fails to grasp the most important aspect of who we are as humans. (2) We are personal beings, who possess personality and self-consciousness. As a being with personality and self-consciousnesses we have the capacity to purpose and choose a path of destiny for our lives. (3) We possess a conscience, a moral compass that gives us an inward awareness of the difference between right and wrong. The conscience has been called the “echo of God’s voice” and reveals there is a Universal Lawgiver to whom we are answerable. (4) We are relational beings. We have the capacity to have a relationship with our Creator and our fellowman. Man was not created to be an island of individualism, but to interact with his Creator and his fellowman. (5) We are rational beings. We were created with the capacity to think, learn and know. Unlike animals, the Supreme Mind behind the Universe has given us minds to enquire, to think and to reason. (6) We are emotional beings, who can love, hurt and feel inward joy and sorrow. Our various emotions enrich our lives and draws us closer to others and endears them to us and us to them. (7) We are creative beings, who have an inner sense of responsibility to produce, create, compose, write, build, etc. The amazing creativity of man has given the world many wonderful inventions and innovations that have helped improve the human condition. While we have been created in the Image of God, sin has marred, distorted, defaced and damaged His image within us. “All have sinned and come short of the glory of God” (Romans 3:23); therefore, the Image of God has been marred in each of us. What is sin? Sin is rebellion against the Maker of heaven and earth; it is willful munity against the Holy Father; it is desiring to be our own God and not giving the One who created us His rightful place in our lives. Anthony Hoekama has written, “[Though] the image of God has been marred and corrupted by sin, we must still see fallen man as an image bearer fo God, but as one who by nature…images God in a distorted way” (Hoekema, Created in God’s Image, 1986, 31). Because of sin, fellowship with our Creator has been broken, morality has been perverted, personality damaged, relationships broken by selfishness, emotions skewed, creativity twisted, life devalued, and knowledge of the Holy replaced by false philosophies of deluded thinking. Thankfully, in Jesus Christ the damaged Image of God within us can be restored. Carl F. Keil and Johana F. Delitzsch write that the “concrete essence of the divine likeness was shattered by sin, and it is only though Christ, the brightness of the glory of God and the expression of His essence, that our nature is transformed into the image of God again” (Keil & Delitzsch, Commentary on the Old Testament, 1996, 1:39). In Jesus, we find “the image of the invisible God…For by him were all things created, that are in heaven, and that are in earth, visible and invisible…all things were created by him, and for him: And he is before all things, and by him all things consist…For it pleased the Father that in [Christ] should all fulness dwell” (Colossians 1:15-19). As we bring our marred and damaged image unto the fullness of Jesus, God’s image in us is renewed day by day as we walk with Him in restored fellowship. Augustine expressed it well: “You created us for yourself, O God, and our hearts will not rest until they find their rest in you.” In Christ, we find the relationship that fulfils and transcends all others. It is in Christ we discover the relationship that elevates and redeems human life and restores the marred Image of God in us. The truth that we are bearers of His Image, even though damaged by sin, will shape our view and behavior toward one another. Since we are all stamped with the Image of God it means every life is sacred, precious and to be valued and respected. We are more than mere animals, but we have the very Image of God stamped on our souls. That being true, may we treat one another with dignity and worth as one who has been created in the Image of God….pointing others to the restoring, transforming and renewing power of Christ.